See the In-Depth LED Comparison Chart at the end of this article. After clicking on it to enlarge, it can be saved to as a picture file for future reference too! As well please read the many references throughout this article. There are two main reason to have proper lighting over your aquarium. The first is to be able to see our inhabitants and the other reason is to support the life in the tank. Both of these aspects will be addressed in this article. The basic unit of light is lumens (lm). This is a unit of luminous flux, which is a measure of the power of light perceived by the human eye. There are other ways to address this light flux, but for our purposes it can be thought of as the total amount of visible light emitted from a source. The more lumens, the bright the light will appear. It doesn’t necessarily mean that your tank will look brighter, as lumens does not take into account the direction the light is going. The lux (lx) is derived from the lumen and is a measure of illuminance. This is the luminous flux hitting the surface. This is important because it is the effectively the amount of useful light. For example 1000 lumens spread over an area 1m2 gives you a figure of 1000 lux; however the same amount of light spread over a 10m2 area gives an illuminance of only 100 lux. See the In-Depth LED Comparison Chart at the end of this article. In short, illuminance is more relevant to lighting an aquarium than the luminous flux (lm) because this is a measure of light that can be in part applied to your aquarium. This figure will decrease the further from the source you get, and so when comparing different light sources the measurement should be taken at the same source. This said, be aware that this standard of “Lux” applies to the visible light spectrum of humans and is thus is even more narrow than PAR. It is important to get a reasonable spread of light in your aquarium. This will allow you to view as much as possible and to get an even lighting effect. This can be affected by the type of reflector or lenses used on a light. The color of light used is critical if you want your aquarium to look the best. Reds will wash out under only blue light and similarly blues will not look good under red light. It is important to choose a light that picks out colors that you want to show. If you want luscious green-looking plants in your aquarium then a warmer white light will work well as it has more greens in the light. Although spread is important, light and dark can be used in an aquarium to achieve dramatic effects. Think about varying light levels throughout your aquascape. Perhaps use a spotlight to highlight your favorite coral specimen. Or directed light to cast shadows in your tank. Remember you are making a display so think of it as lighting a stage. Always check the lighting requirements of the animals you are keeping. Some need lots of light to survive, while others prefer shaded spots. Visible light is actually a form of electromagnetic radiation that our eyes are sensitive to. This means that it can be thought of as waves of energy radiating through space. The length of one of those waves defines the color of the light and for visible light it is measured in hundreds of nano meter (nm). For example, violet radiation is about 410nm-440nm, the comes blue at 440-460nm. This continues through all the colors of the rainbow until we get to red at around 700nm. When these wavelengths are combined, different colors can be made. For example 450nm blue and 700nm red would look like purple light to us, which is also known as CRI. What is worthy of note is that mixing of blue and red does not give you 410nm violet, RATHER the appearance of violet/purple. When most of the colors are represented in fairly balanced amounts (particularly red, blue, and green), then the human eye will see it as white light. The amount of each color in a light is called it’s spectrum. A good spectrum will be as close to natural sunlight as possible which mean there will be light present from every wavelength throughout the visible spectrum. Photosynthesis is a process that both plants and most corals use to turn light into food. This process allows these organisms to grow and flourish, and without the correct light energy they will die or with some marine animals that use this process for part of their food, they will simply not flourish. PAR-(Photosynthically Active Radiation) is the measure of light within the range of wavelengths used by photosynthetic organisms (400-700 nm). It is measured in microEinsteins/m2/second. In physics, light is thought of as particles of energy, or photons. An Einstein is one mole of photons, where a mole is the number of carbon atoms in 12g of carbon (6.0221415×10^23). Like illuminance, PAR measurements will decrease the further from the source you get, and so when comparing different lights the measurement should be taken at the same distance. So, PAR is basically a measurement of the amount of light that photosynthetic organisms can use, and photosynthetic organisms include the plant and corals in your aquarium. This make it an important factor in choosing our lights. If you are keeping certain species that require a lot of light then you need high PAR levels. These doesn’t necessarily mean getting the brightest light you can, because the quality of the spectrum of light is important. Some lights can provide broken spectrums which mean that although it is delivering high amounts of light in certain colors, it is lacking in others. The light may still appear to be white, but it may have serious deficiencies. PAR is therefore a partial but not complete indicator of what will work over your aquarium. PUR stands for Photosynthetically Useable Radiation. This is even more useful than PAR as with PAR is what an organism can use, PUR is what it actually does use. Unfortunately, this is impossible to test for as it differs from species to species. It is worth nothing through that high PAR does not guarantee good results, but light energy within the known “spikes” of PUR is the better guarantee of results with less wasted energy. Unfortunately it isn’t quite as easy as just putting as much light as possible over your aquarium. There is a point at which light becomes damaging to plants and corals in that it actually reduces the ability to photosynthesise. Plants can get burnt and wither and corals can bleach. It is important that you recognize this when choosing your lighting and make sure you don’t over do it. As light passes through water it loses energy and is eventually absorbed completely. This means that it is important that the light you use has enough energy to pass through the depth of water for your tank you are trying to light. Generally speaking this isn’t usually a problem unless you have a deep tank and want to keep animals that need high light levels at the bottom of the tank. Ways to ensure good penetration of light is to use very high power light (this method can be quite wasteful), or to focus the light to make sure that it reaches to where you need it. As light is absorbed by water it changes color because the lower wavelengths are absorbed first. This is the one of the reason that deep water can sometime look blue. This means that certain corals are adapted to more blue colored white light. Color temperature is a way to describe the color of white light. It is based on the color that a black body radiator will go as it is heated to very high temperatures and measured in Kelvin (K), which is a unit of temperature used in physics. So, at 3500K the white light is yellowy, like a standard light bulb. Natural daylight on a bright sunny day is considered to be 6500K. The more blue-whites that are good for keeping marine animals are at around 10000-20000K. When changing lighting, you should expect a transition period where the plants and animals are adjusting to the new set-up. This can sometimes take a few weeks. There are three main types of lighting that can be used on aquaria. Fluorescent, metal halide and LED. Before the emergence of high power LEDs, the aquarist would have a fairly easy decision to make on whether to use metal halide or fluorescent lighting as they each have very clear and different advantages/disadvantages. LED light is now able to outperform these technologies in most cases, but there are still important considerations to take into account for each type. Since LEDs are relatively new to aquarium lighting, but has taken the hobby by storm due to it’s longevity and practicality the remainder of this article will focus on different LEDs that are on the market today. If you would like more information on fluorescent or metal halide lighting, please see these additional resources. If you would like some great in depth information specially about LEDs and their evolution in the aquarium world, please see this trusted source about the topic. With this aquarium lighting article, a great deal of effort has been put into to finding the best aquarium light on the market today. There is a handful of measures that are taken into account to make something the best. 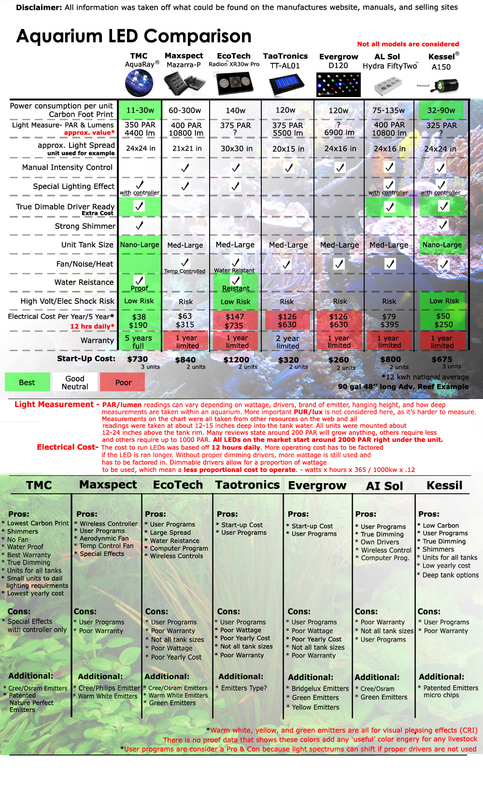 If you would like a great suggestion what what I think is the best light on the market, please take a look at this comparison chart that has been put together. It looks at some real contenders when it comes to aquarium light. The chart shows pros and cons of each light. LED were the only lights compared in this chart, because as a standard, LEDs are becoming the best for aquarium lighting. Now, figuring out what LED is the best of the LEDs on market is the next step. I believe this chart will help guide many in the right directions. Comparison chart to show all pro and cons of major LEDs on the market. What is also worth noting is the Warranties, as most of the popular Aquarium LEDs are only warranted for one year, so in the end the bargain may not be a bargain when the LED fails in 3 years. While a reader might think this is not likely; actual failure caused from excess heat, often the result from fan failure is quite common, since all LEDs but for the TMC require cooling fans due to their excess heat production which is a result of the technology used to drive/control their lights as noted earlier.